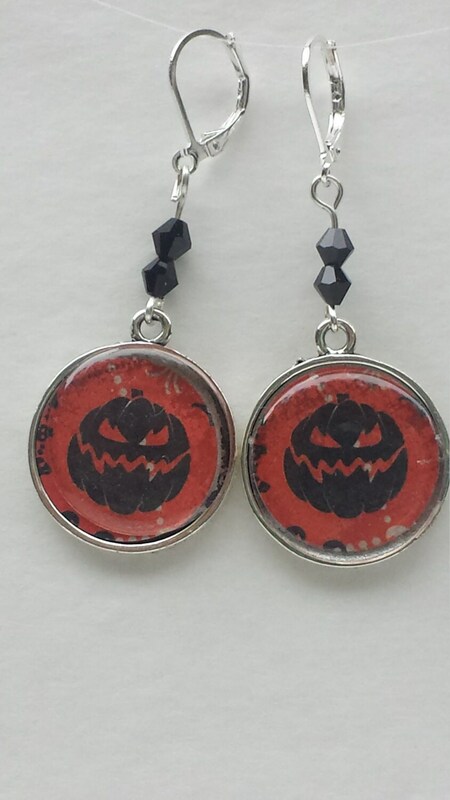 Black pumpkins on a red background in a silver-toned bezel, covered with a resin sticker. More vintage Halloween prints I found and had to use in some way. These pumpkins are a little scary looking but are still adorable. Halloweenish and yet a bit different. These earrings would be a subtle way to celebrate Halloween. What a great "treat" for yourself or for someone else. Nonfattening and not bad for you teeth! When purchased, these earrings will be boxed and then mailed in a padded envelope. FREE SHIPPING!!!! If you would like to see different colored crystals, feel free to convo me.